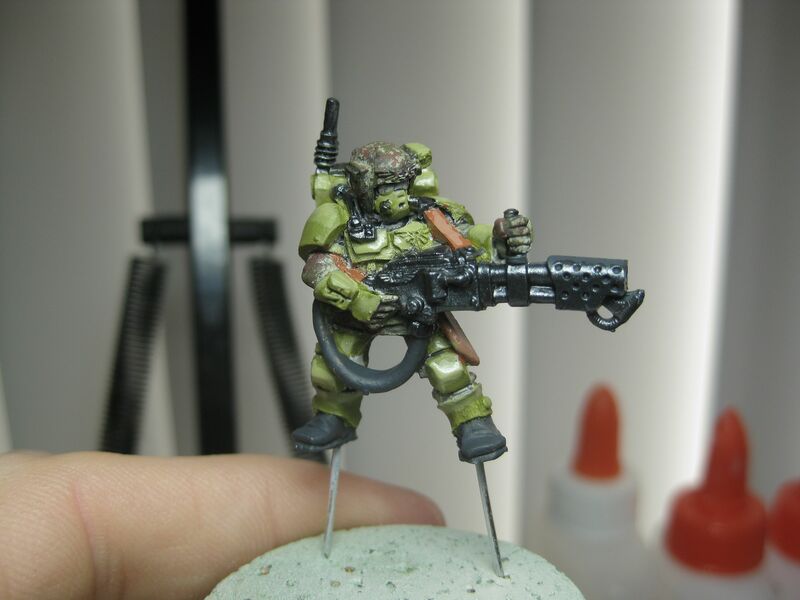 The other day I posted an article on How to Paint Imperial Guard Infantry Camouflage. 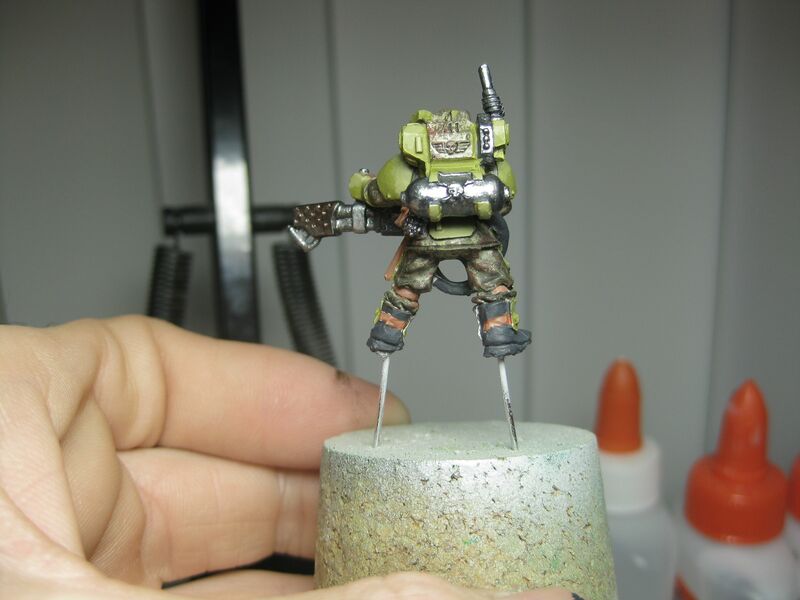 Well, today, I’m going to continue the process and show you how I painted the armor. The process is not difficult, and if you’re a seasoned guard player, you probably have your own method that works nicely. 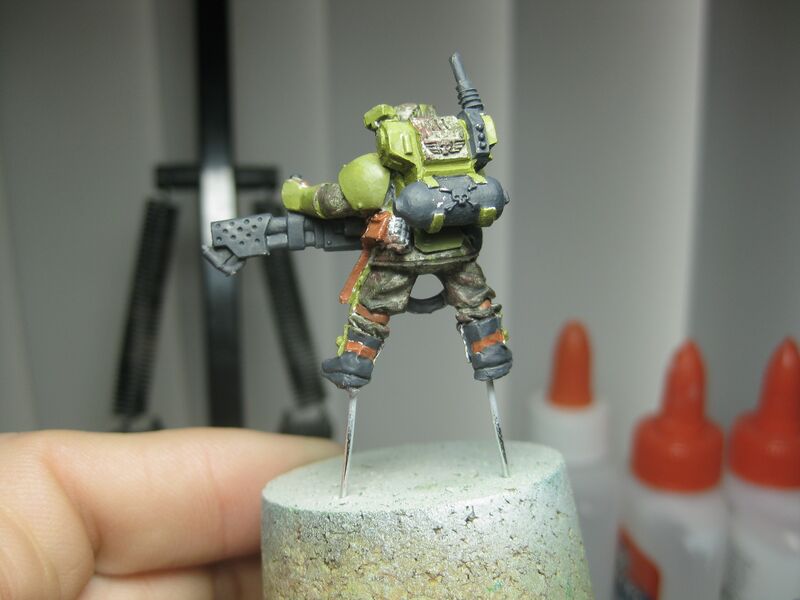 The process of painting the body armor for my guys is a bit different. 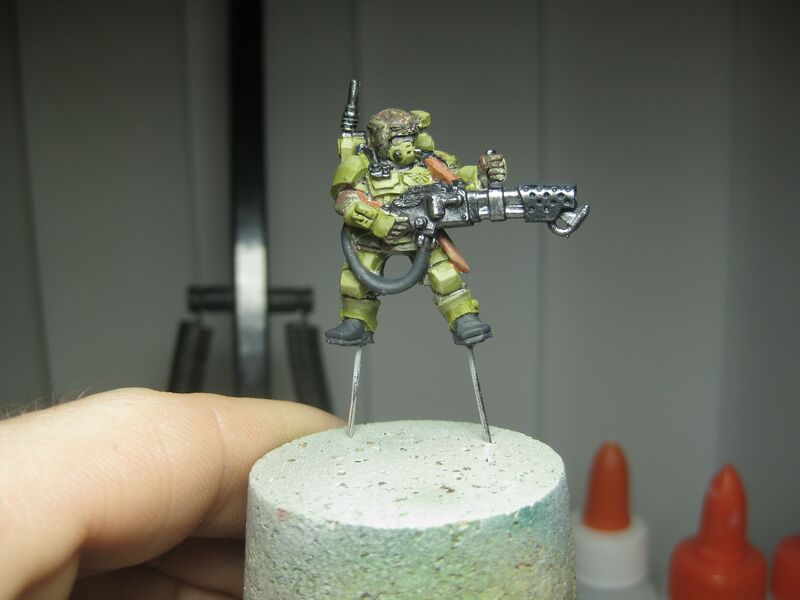 I needed a color that would work well with the camouflage scheme that I gave them, but contrast enough so that the model and details would not be lost. I choose to paint the body armor a solid color to help contrast it from the camouflaged fatigues. I’m just blocking in the colors at this point. 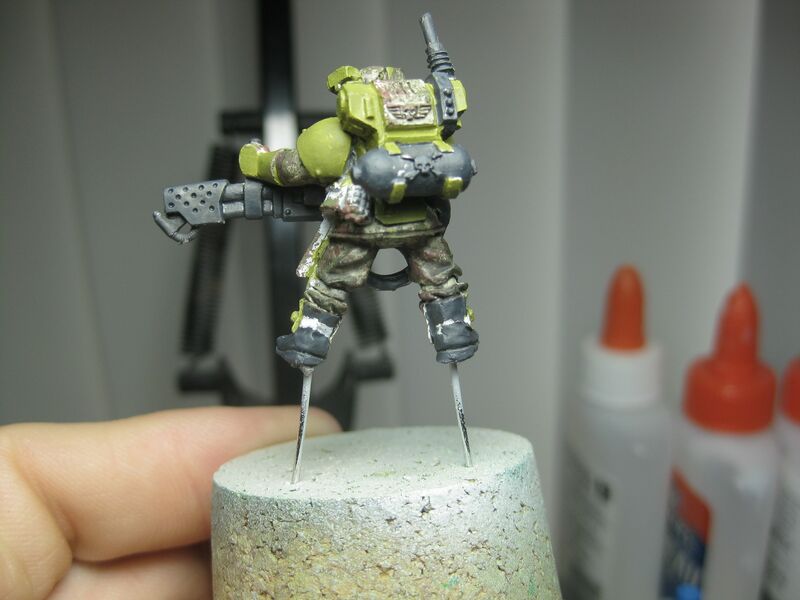 The armor gets a coat of Vallejo Model Color Yellow Green, and all the parts that are supposed to be black or going to be metallic are painted with Vallejo Model Color German Grey. I rarely paint anything pure black anymore. Black is a difficult color to work with. You can’t shade black, and it has a tendency to obscure detail. German Grey works better as it appears to be almost black. Once it’s highlighted with another color, a black wash will shade the recess into a black color giving the illusion that the object is a black color. Next, I go in a paint the webbing and leather objects with Vallejo Model Color Red Leather. 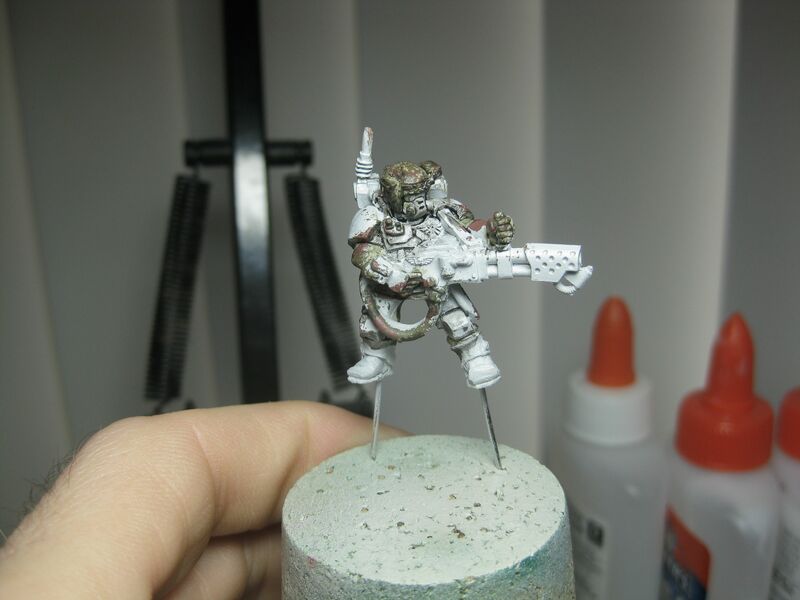 This will get highlighted and then washed with a brown wash to give it a worn leather look. I now begin to highlight the armor and leather objects. I mix the base colors, Yellow Green and Red Leather, with Vallejo Model Color Stone Grey. The Stone Grey helps to lighten the color softly with out it becoming too chalky or pastel looking, which using White could do. To help blend it into the other colors, I mix in glaze medium. I don’t use exact ratios, but instead, I just eyeball it. If you go to extreme in one direction or the other, you can take the base color mixed with glaze medium and blend it together. You’ll also notice in this picture that metallic parts get a coat of Vallejo Air Color Black Metal. At this point, I make a mixture of Vallejo Game Color Gun Metal and Vallejo Air Color Black Metal and paint the parts that I want a stronger metallic look with it. 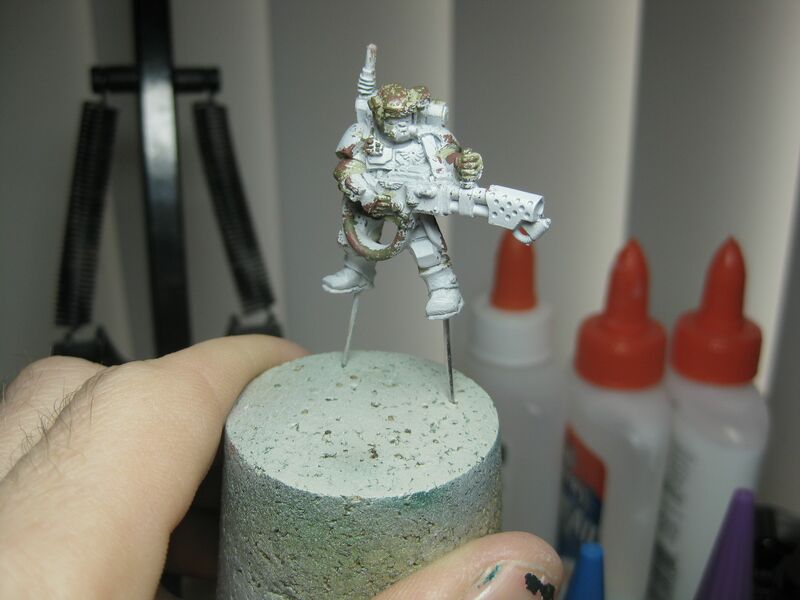 The main body of the gun remains a black metal color as does some other details on the model. This just adds variations on the model. 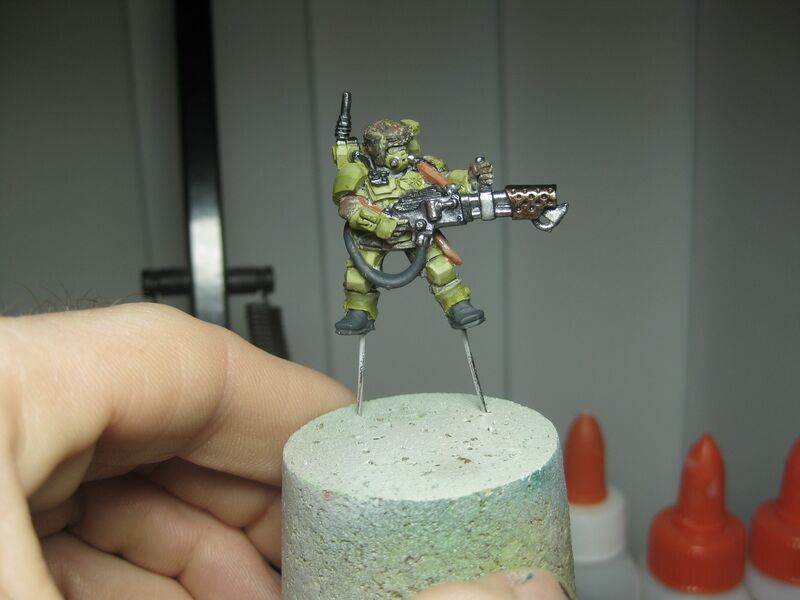 The final step is to add color to the flamer nozzle and handle. I used Vallejo Air Color Aluminum for the flamer handle and pilot light. 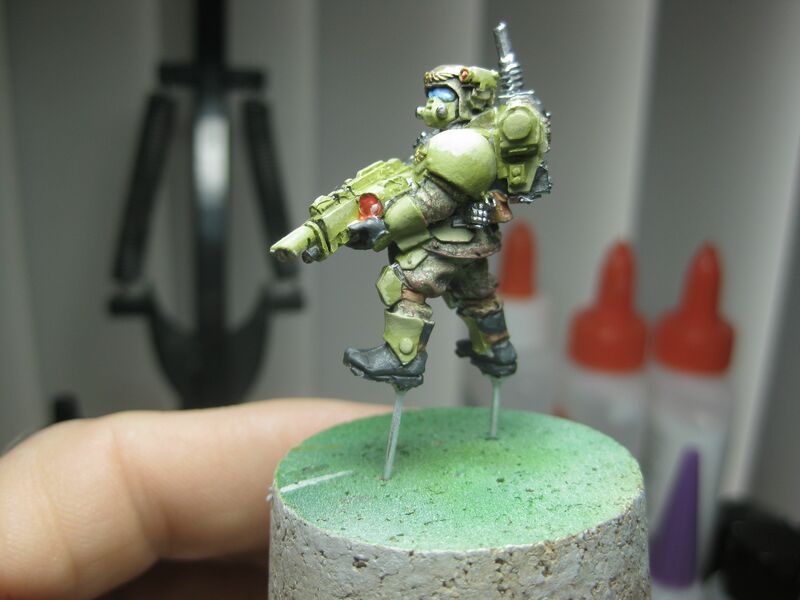 The nozzle is painted with a coat of Citadel Tin Bitz. 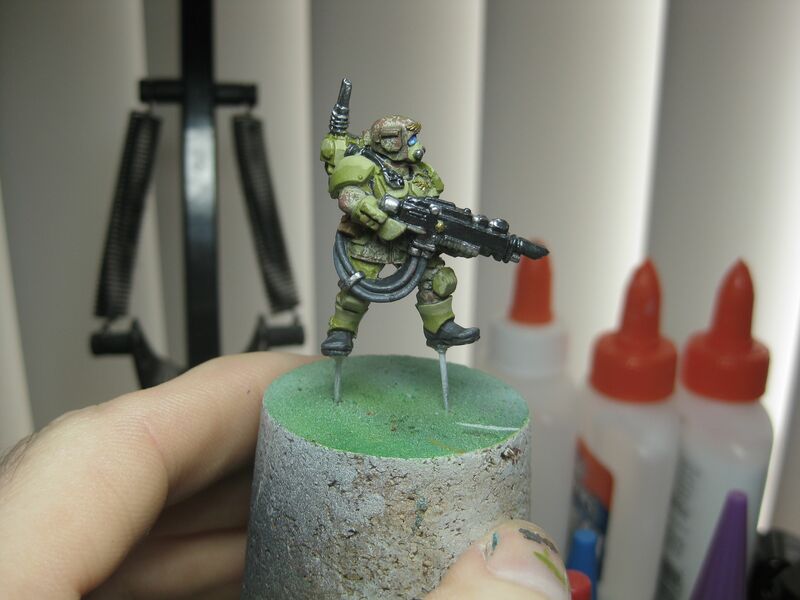 To add some contrast and depth, I mix some Vallejo Air Color Aluminum into the Tin Bitz and paint the top portion of the nozzle. That does it for this round. 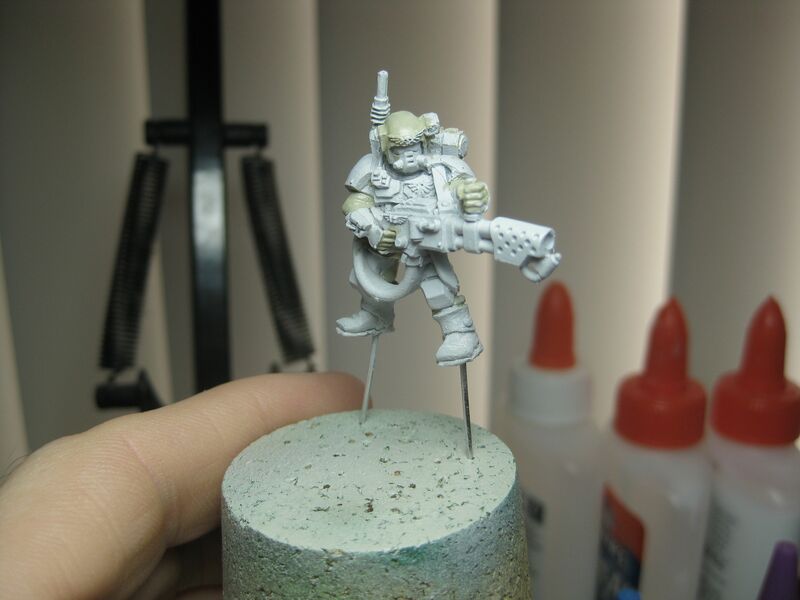 The next tutorial should be quick one as all that’s left to paint are the goggles and high light the boots. Check back later, but don’t forget to go back and check out the first article. 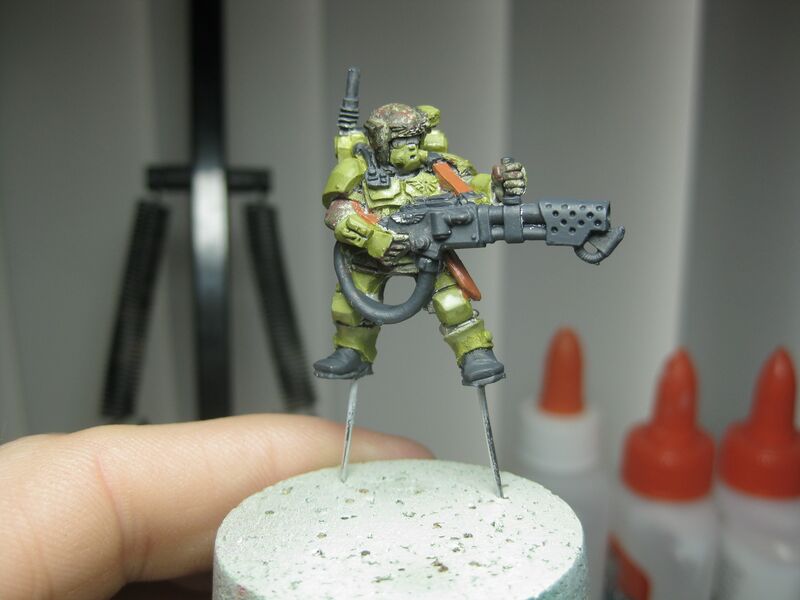 As promised, I’m posting my quick little tutorial on how to paint camouflage on Imperial Guard infantry. 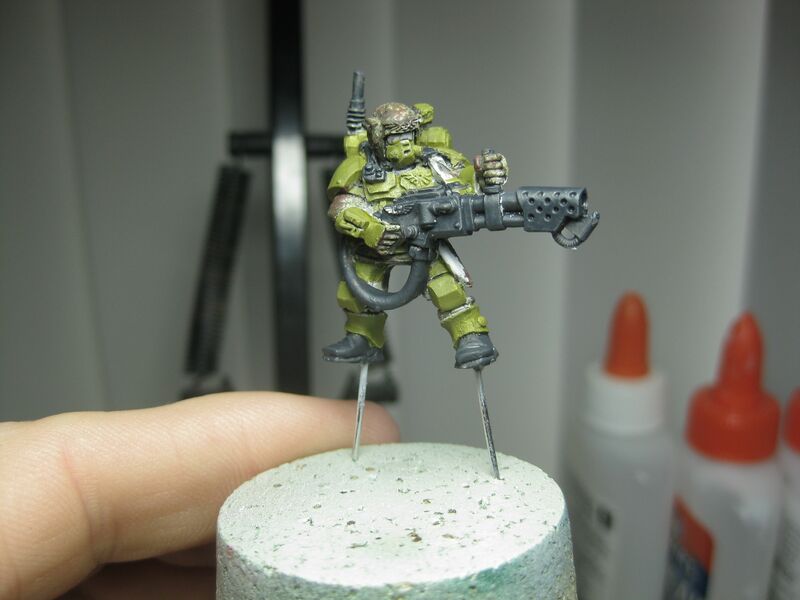 For my upcoming Imperial Guard army I wanted to do something a bit more interesting than the usual paint scheme demonstrated above. 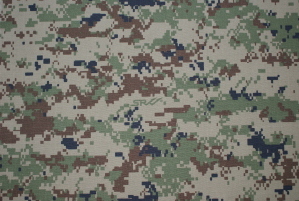 I drew inspiration for my color/camo scheme from modern military particularly modern Russian SURPAT. I felt this color and pattern would be foreign enough to most the players here in my area that I would seem original and possibly from another planet. The challenge was matching colors. Because I was going with something that is foreign to what most Americans would model or paint, matching the colors was a challenge; however, spending time with experience scale modelers helped. 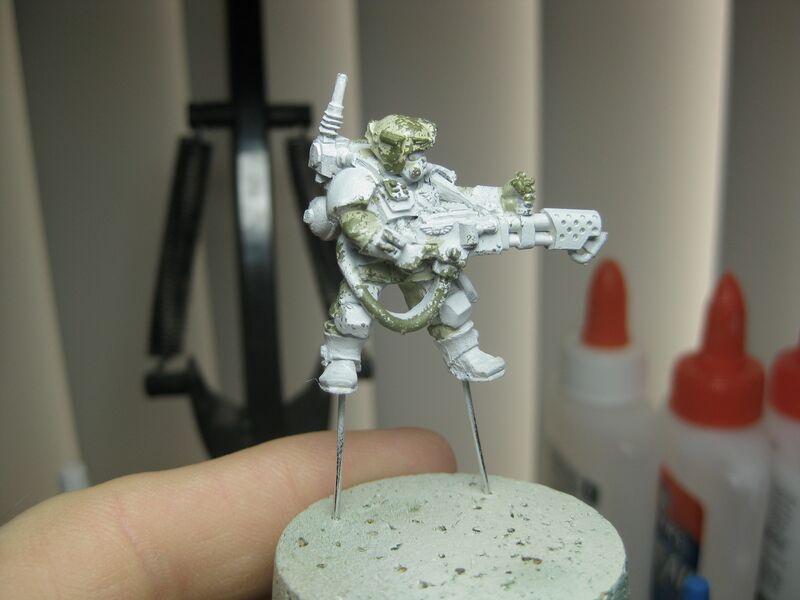 I figured getting the actual digital effect would be impossible on an infantry model, so I figured I would have to give the impression of a digital pattern. Second, I stuck with only three colors. In my opinion, I thought the black would be too stark and obliterate the other colors, so I went with the grey/khaki color, the brown, and the green. Now, let’s get down to painting. 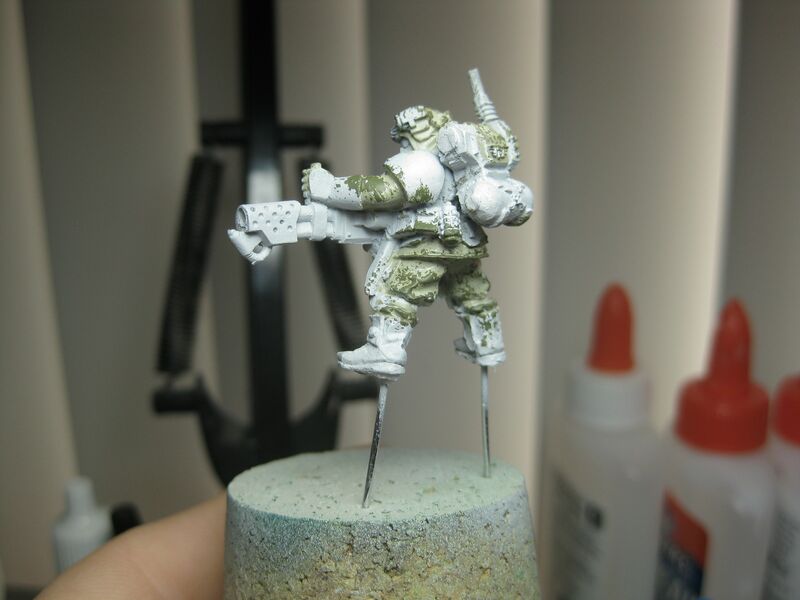 After prepping the model, I airbrushed Vallejo’s Surface Primer Grey. This dries to a very smooth finish, and the neutral color will keep the colors bright until I put a wash on it. Not only is this stuff great for making paint chips, but it turns out it’s also does a good job giving the illusion of a digital camo pattern. I started with the green color. For this, I used Vallejo Model Russian Uniform WWII. I dabbed a small piece of foam in the paint. 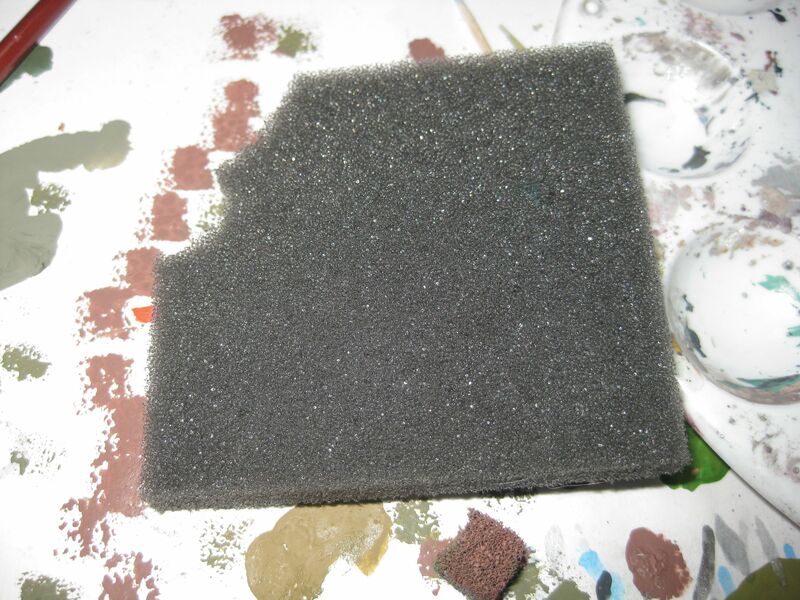 I then dabbed the foam loaded with paint on a piece of paper before I started stabbing the model with it. You don’t want to go too crazy because you’ll be putting on another color, and you’ll want your previous two colors to still be visible. The brown is Vallejo Model Saddle Brown, and it’s done in same way as the green was done. 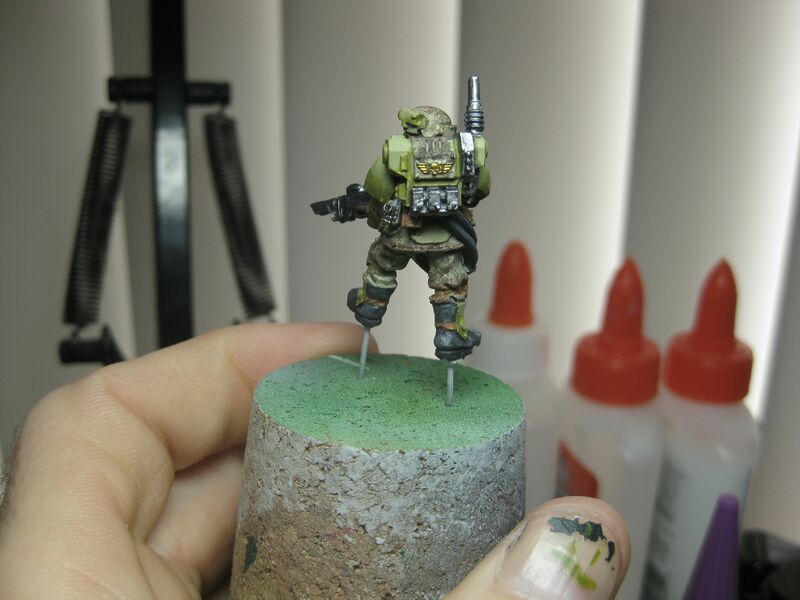 At this point, you can jump between the three colors to get the right mix of camo on the miniature. If there are spots the foam is not reaching, I take a small used paint brush, load it up with a little paint, and gently stab the areas I want. Finally, I wash the model with black wash. This does a number of things on the model. 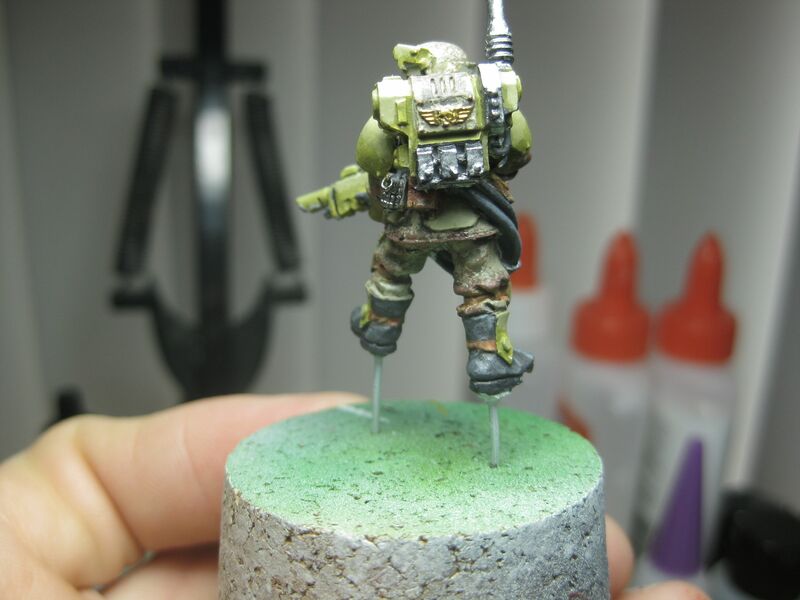 Obviously, it brings out the folds and lines of the model that the camo maybe blurring out; however, it also helps blend the colors together so there’s not such a stark contrast between grey, green, and brown. All told, I think the painting time is maybe 10 minutes, but I would wager it’s lower. This is good for an army that can be very infantry heavy. A squad should only take an afternoon to paint, but they will still look good on the table. These will also look great on forest bases that I’m planning to put them on. Next I’ll should you how I do the armor and weapon, so stay tuned. I’ve wanted to do an Imperial Guard army for awhile, and now that I’m selling things off to make room for new stud, I can finally do that. However, I have to make things difficult. 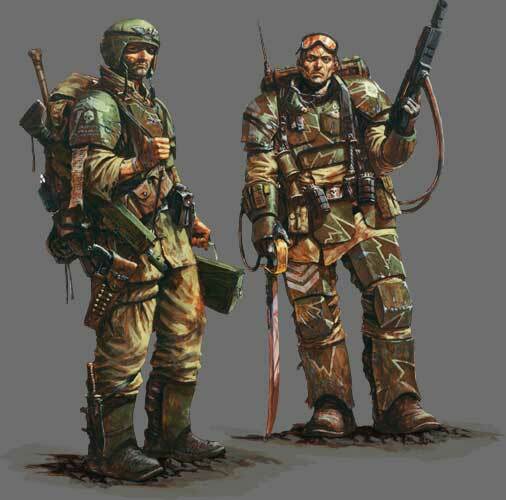 I don’t want to do a standard Imperial Guard. 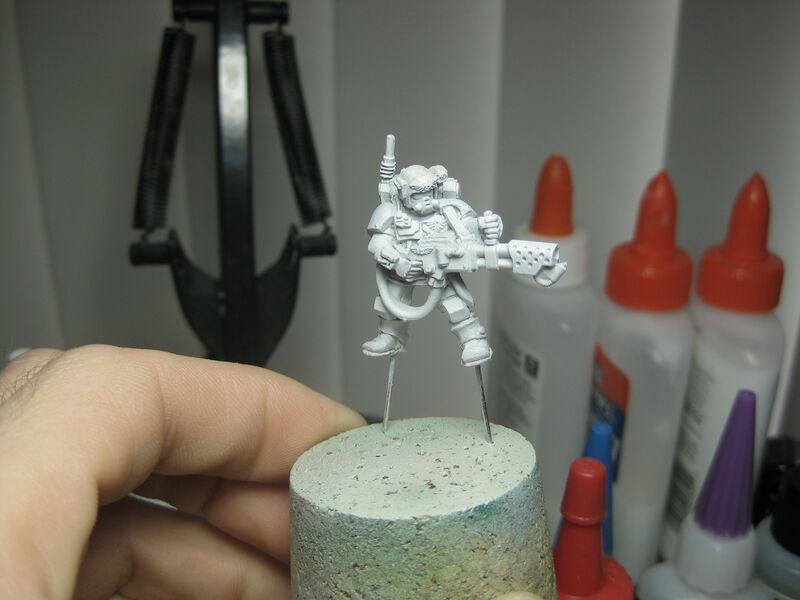 No, I’m doing an Airborne Imperial Guard. Now, I’m not going to get bogged down in rules and army lists yet. 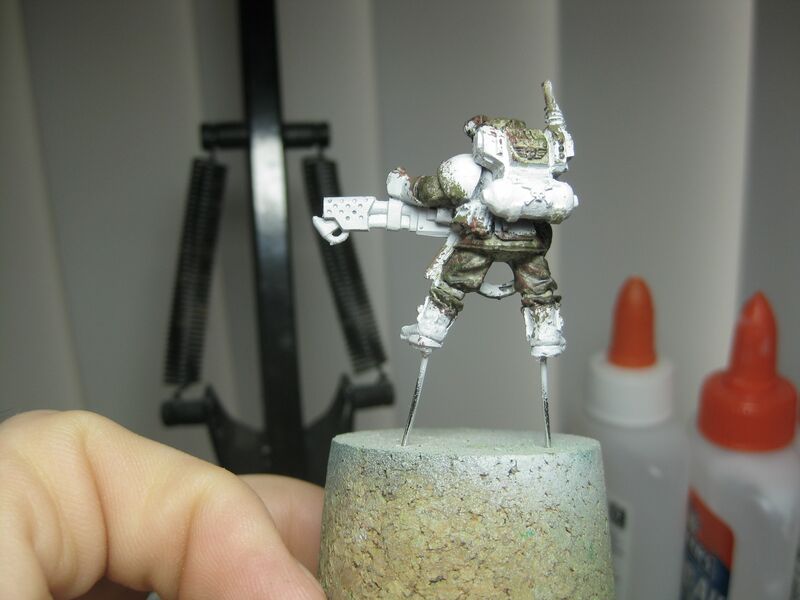 This post is to show off my test model for my Imperial Gurad camouflage scheme. Here it is. It’s an Imperial Guard Kasrkin stormtrooper, so the camo color and pattern are difficult to pick out, but the other photos will show it off a bit better. The harsh light and extreme close up probably doesn’t make the model look great, but on the work table, it looks good. The camo pattern was easy to achieve. I simply used a piece of foam you might find in a blister or from some pluck foam storage trays. I used a light primer, and my camo colors where equally light. 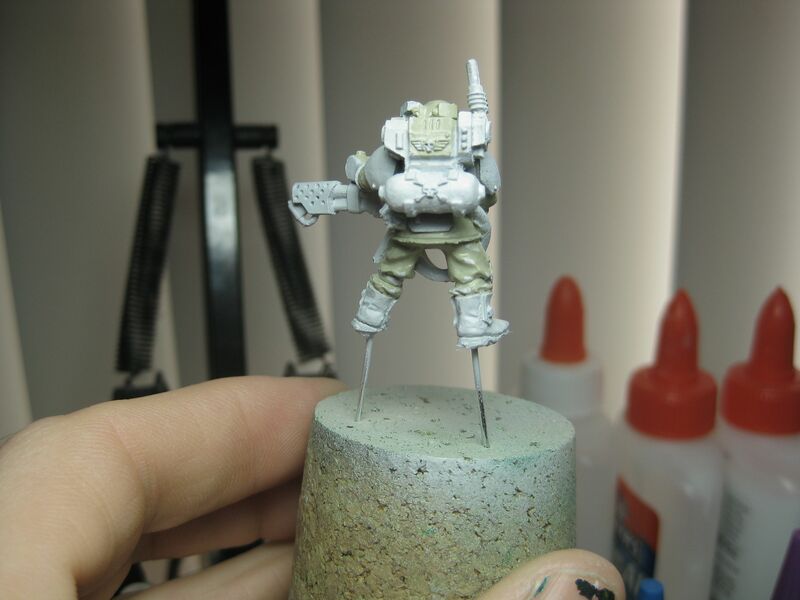 I did this so when I went over the fatigues with a black wash, the miniature wouldn’t become too dark. 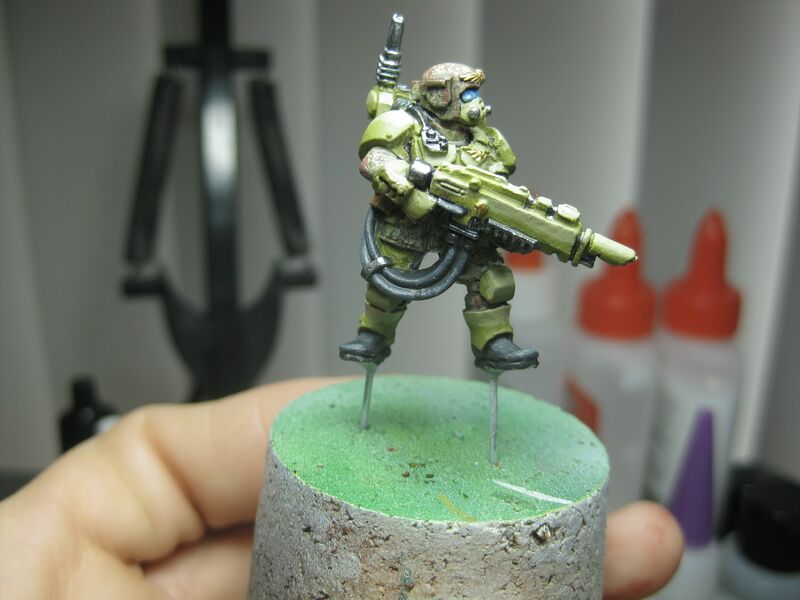 I went with a corresponding but contrasting color for the armor to help the miniature stand out some. The lenses and goggles will get a coat of Tamiya Clear Red and Clear Blue after I seal the model and do an oil wash. Once it’s all completed, I’ll probably throw a little weathering powder on and base it on a forest base. The only thing I’m up in the air about is the gun’s color. I don’t know if I want to do a black/gunmetal color or the camo color. 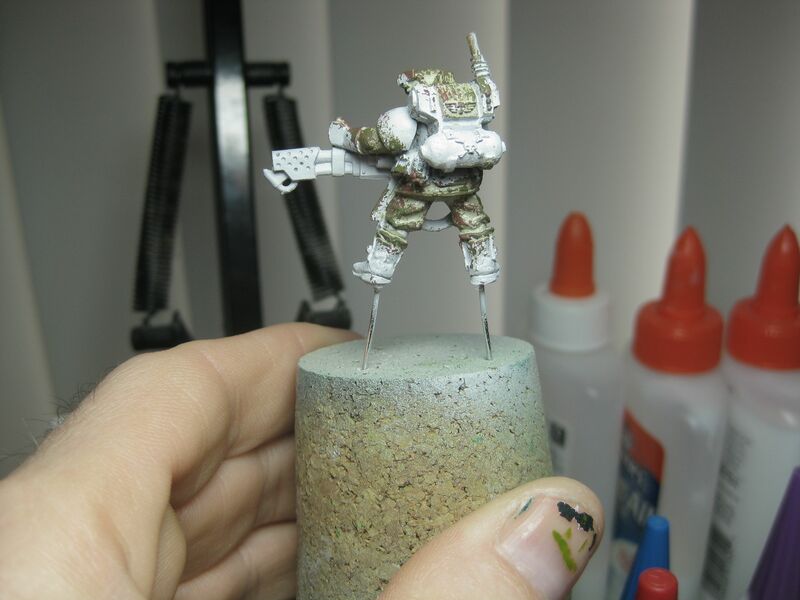 I’m afraid that if I do the black/gunmetal color the hands will get lost, but the camo color might dull the miniature down and make it hard to see (I know; that’s the point of camouflage). After getting some feed back, I made a quick change to my Stormtrooper. Here’s what he looks like now. As you can see, I change the color of the gun to a black metal color. 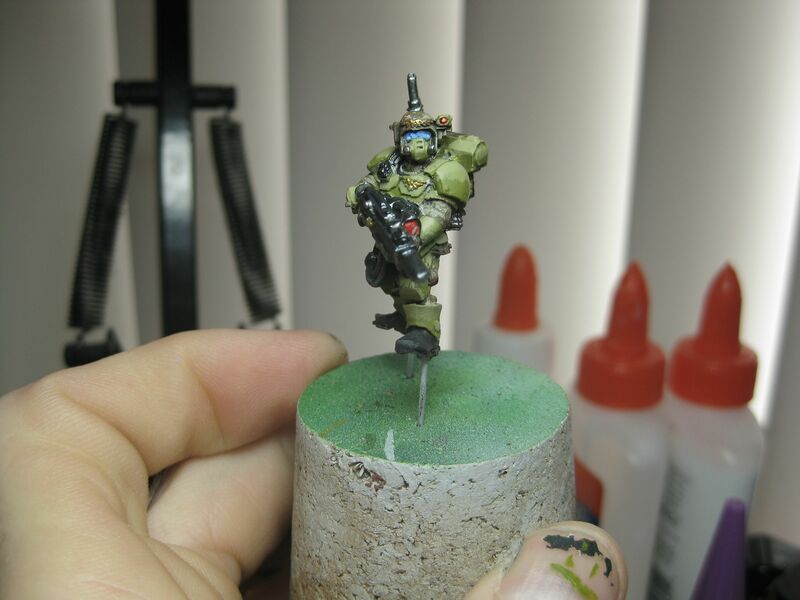 To make sure I don’t lose the hands, I painted them in the camo scheme that the rest of the miniature is painted in. This brings the camo out just a touch more, but because of the gun’s color everything is contrasted some. It’s just enough of a difference to help keep everything balanced.